William Henry Wale, beloved husband of Carol of Claresholm, passed away, surrounded by loved ones, on Wednesday, August 29, 2012 at the age of 59 years. Besides his loving wife Carol, Bill will be remembered by his four step children, Corey (Chris), Mindy (James), Jason (Amanda) and Larry (Steph); grandchildren, Em, Haylee, Kee-ana, Wyatt, Kyla, Chase, Cedie and Hayden as well as cousins, Tammy (Jim) Jensen and son Tyler, and Vanessa (Shane) Koshney and their children, Ryan and Dan. Bill will also be remembered by family in England, Aunt Betty; cousins, Linda, Margaret and families and Richard and Stephanie Lord and sons, Michael (Nicole) and David. He was predeceased by his parents William and Elizabeth (Maude), and cousins, Geoff and Jessie Godley. Bill came to Canada in 1977 and worked at the Claresholm Care Centre as a papered Chef. 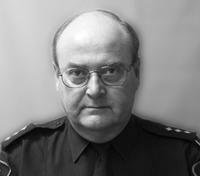 He later worked at Spyhill, Grand Cache and the Lethbridge Correctional Centre, where he was promoted to Deputy Director of Operations. Bill was involved with government services for thirty-five years. He also served as President of the Royal Canadian Legion, Branch #41 from 1998 to 1999, 2001 to 2002 and 2011 to 2012. His greatest passion was going to Las Vegas and playing darts. Funeral Service will be held at LEYDEN’S CHAPEL OF REMEMBRANCE (4079 1st Street West, Claresholm) on Wednesday, September 5, 2012 at 2:00 P.M. Interment to follow at Claresholm Cemetery. If friends so desire, memorial donations may be made to the Canadian Cancer Society, Tel: (403) 205-3966, www.cancer.ca . Condolences may be forwarded to the family by visiting www.leydens.com . Arrangements entrusted to LEYDEN’S FUNERAL HOME, Claresholm. Tel: 403-625-3212.